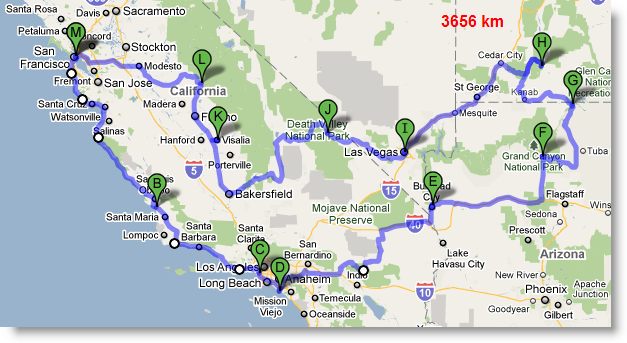 In this blog you can follow us on a 18 days road trip through the west of the US. 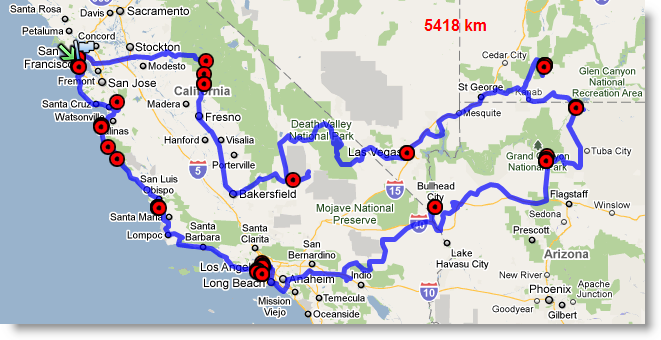 We are travelling by car and the start and end point is San Francisco, Californa. The route goes directly at the west coast (via Monterey and Pismo Beach) to Los Angeles. Afterwards we are going through Joshua Tree National Park to Laughlin. Then we are going to the Grand Canyon and resume our travel the day after to Page, Arizona. After visiting the Bryce Canyon, we are going to Las Vegas, Nevada. After couple of day relaxing, we drive through the Death Valley to Yoesmite National Park. The last part goes back to San Francisco, where we’ll finish our holidays with some days of sight seeing.